Busy day yesterday. 15 pages on a screenplay, worked on the critique project, pitched for some jobs. Gave some requested quotes. Was out of the house before noon and to Sandwich to the storage unit. A group of us from the Writers Center sorted out 50 years’ worth of material that had stacked up. Some of it was tossed; some repacked; some will have to be sorted in detail over time and shredded (because of personal information). But we can definitely move everything to a smaller (and cheaper) unit. On the down side, they auctioned off the contents of another unit. I don’t care about the “why” — seeing the ghoulish vultures descend upon the space made me SICK. After we were done in the unit, I headed over the bridge to Buzzards Bay for a development committee meeting at NMLC. I couldn’t stay for the whole thing, but we worked on some ideas. Had to dash home and step in as moderator for a live chat during a television show, featuring actors and fans. A friend of a friend was supposed to do it, and then had a medical emergency, so I stepped in. I’ve worked with moderators when I was the featured guest before, so I knew how to do it, but I’d never actually juggled the chainsaws before. It went well, was fun, and several of the actors and fans thanked me after the chat. Today. I have to get a lot of work cleared off the desk to make up for being offsite yesterday, although it was nice to have a change of venue. Talk about feeling silly — I took such good care of myself hauling the heavy materials, and then wrenched my foot later, at home, taking off my boot of all things! PS Sign up for “Organize Your Writing Life” on Dec. 7, here. Three hours online, and a year’s worth of writing organization. It looks so pretty with the frost on the grass! 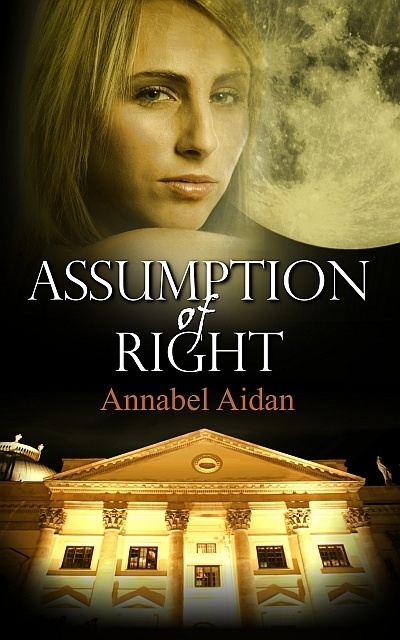 The exciting news is that ASSUMPTION OF RIGHT was included in the CAPE COD TIMES’S column of “Books to keep you warm on Cold Cape Cod Nights”. I had no idea, and was thrilled to open the paper and see it. To be mentioned in the Sunday paper’s book section — with a cover photograph — I was thrilled! Saturday morning was the holly walk — the first thing I did when I moved to the area last year, and still something I love to do. It was so much fun, and it’s fascinating to see how the Sanctuary evolved through the year. Got some holly boughs (yes, it’s part of the walk, I didn’t just take them) — will try to use some of the berries (well, the seeds in the berries) to start some hollies that are descended from these trees. They’d have special meaning. So the thumbprint cookies are not an option this year. Prepped 5 dozen molasses spice cookies for the next day’s baking. The molasses took care of the streusel effect, and it was not a problem. Sunday, after reading the papers, I baked the 5 dozen molasses spice. Perfection. I prepped the dough for the eggnog angels, the only rolled cookie I planned for this year. Again — streusel effect, even with the eggnog. I put the dough into the fridge to chill, hoping that would help. Then, I baked 3 dozen oatmeal raisin cookies (the replacement for the thumbprint) and 5 dozen banana-walnut-chocolate chip cookies. The oatmeal raisin cookies can be a little crumbly, and the mashed banana helped smooth out the butter. When I tried to roll out the dough for the eggnog angels, no dice. You could roll it, but as soon as you used a cutter, they shattered. So I used the same method used for the molasses spice — rolled into balls, dusted with sugar, flattened with a glass dipped in sugar. It made a lot more than the cutouts would be, and they’re round instead of angels, but they taste good. Hopefully, the icing will still work on them. Without using the sugar to roll and flatten, they fell apart. Today, I have the mini-lemon bundt cakes and all the glazes/icing to do. Tomorrow, the platters are packed and go out the door. The rest of the packages also have to be wrapped and packed today, and go out the door tomorrow. In the meantime, I had to spend time with students, read a friend’s manuscript, and then a client project came in for immediate turnaround. This is not the client’s usual MO, so, while there’s definitely the rush fee attached, I’m not refusing the job. I’m also working on my business plan for next year. I want to change a certain amount of things. This was the first year I had a chance to really see what it was like to work without the pressures of scumbag landlords and Broadway commute. What I learned from this year, I can apply moving forward, to shape my work like into what I want AND what meets the financial needs. In order to do that, I have to tweak some things and radically change others. And then there was The Stroll. The Village Holiday Strolls are a HUGE deal on the Cape. Every village has on. If you live there, you damn well better get out there and STROLL, or you hear about it all year. I was too tired last year, having moved here a few weeks before, and I’m STILL getting flack about it! So I stopped everything, showered (dough in the hair is not a good look for me), dressed, and off we went. Parking was a nightmare, because there isn’t any. They block off the streets that actually have parking lots, so you’re off trying to find a side street with no lights on and park on the edge of someone’s property. Everything dead-ends, but there’s no room to turn around, because the streets are narrow, filled with parked cars, and more cars are coming at you all the time, but there’s no exit. And everyone’s in dark colors, darting around the streets, so you’re worried you’re going to run someone over. Only the dogs have reflective collars on. And there ARE dogs — tons of them. Which is very cute. The dogs stroll as seriously as the people. And they’re so well behaved, with all the chaos and the noise and the smells and the other dogs. They don’t even try to steal the hot dogs! The historic houses and everything else are all decorated to the hilt, the streets are blocked off so people can wander, and tables are set up with hot chocolate and hot dogs and baked goods and all kinds of stuff. There are donation buckets set up — not quite sure for what. And teens running around with buckets asking for donations for the needy. I’m such a cynical Manhattanite that I assumed it was a scam, but I was told it’s actually true. It’s fun and festive, although there were too many teenagers who’d consumed too much sugar racing around, shrieking. But they weren’t doing any harm, and they were having fun. It’s not like they were wilding or anything. Teenage conversation here is so different than in Westchester, where all they did was whine about their parents not paying for enough. Here, they actually go out and do stuff and talk about what they’re doing and want to do, and make up actual adventures, and then go HAVE them. They’re much more aware of and engaged in the world, which is nice. I think they’re smarter, too — probably because their parents aren’t all over-medicated and aren’t over-medicating them. And then the microwave died. Billowed smoke, got very hot, smelled weird. Unplugged it, cooled it with ice, will have to get rid of it. No microwave popcorn for me for a bit! Well, I don’t use it that much anyway, so it’s not THAT big a deal, but, after the holidays, I’ll probably get a new one. I’m doing a live chat tonight at 7 PM over at Savvy Authors, talking about short stories in general, and my 5 in 10 short story workshop that starts in January in particular. This week, I also have the Writers’ Association Holiday Dinner and a yoga party. Busy, busy! And I figure, if I’m lucky, I’ll finish decorating the house by Christmas Eve! Back to the page, and onward. So the snow was supposed to stop at 11 AM yesterday. Um, where? A little before 10 AM, I went out to shovel slush and put down ice melt. A bit of a pain, no problem. It started snowing again around 11, and the city truck went past — pushing snow into my nice, clean driveway! I stomped out with the shovel to clean it, and said Many Bad Words in a Row. It snowed well into the evening, so this morning, I’m off to shovel again. Doesn’t look too bad — nice and clean. About another 2-3 inches. Spent the day writing, reading, commenting on the class. Got an idea for a piece and outlined it, well, the opening — not sure if it’s a Victorian urban fantasy comedy or steampunk. Percolated on the Samantha Light piece that’s been percolating for the past week or so, and also got an idea from a magazine article for a speculative fiction short story. So that was productive. Reworked the Very Big Proposal, and will go over it one more time before I shoot it off. I think I’m ready for the commitment. Sorted out the four-jobs-in-two-weeks-in-CT that I’m doing in February. Hey, I can use the cash. I’ve got bills to pay and patio furniture to purchase! I need to get on the stick to market for March work. January’s been a good work month, February sorted itself out without much effort on my part, April will be light until we get into May, and then May is already booked. But March — I mean, I can’t celebrate my birthday for a whole month, and I do have bills coming in! Live Chat went well last night — interesting questions. Hopefully, I gave them some good stuff to consider in their work. Today, I’m off to Dennis to an herbal seminar (with my shiny new notebook) and then, this afternoon, I’m going to meet the town librarian and get my library card. That always makes me feel like I really live somewhere — getting my library card! I’m going to try to spit out a few more pages, then suit up and shovel, and off I go! I’m falling into the Cape pattern of being Very Busy all the time. Granted, I get an awful lot done — but I’m still Very Busy. After catching up with online business, I headed over to Osterville. I put the car title in the safety deposit box and ran into the owner of the hardware store there. I met him back at his store — he got me set up with a year’s worth of filters for the furnace, and we talked lawn mowers. He showed me one that’s the right size, weight, and price for me. It’s a heck of a lot less expensive than anything I’ve seen yet, a reliable brand, and he’ll deliver it. Not only will it cost me less, I get to support a local business. I’m waiting until he gets a few shiny new ones in at the beginning of spring, and we’ll sort out the details. Load off my mind, and I don’t have to try to fit a lawnmower into a Volkswagen. This is one of the great things about living in the area — people remember you and are actually interested in trying to get you what you need, not just part you from your money. Ran some other errands, spec’d out some large plant pots at good prices (and they’re pretty) and some garden decor at good prices at three different places, so I have options. Picked up cat food, so now it can snow! And some milk for my coffee and my hot cocoa. Bought some more scratching boards so now there’s one in every room of the house except for the kitchen. They’ve never been furniture scratchers, except they are now scratching the new wingback chairs. No. So I’ve put catnip-scented scratch boards beside each chair, and that seems to be catching their interest when they wander over to be naughty. And, on the times they take that minute to think and make the conscious CHOICE to choose “Scratchy-Scratchy” over the chair, they get a treat. Iris is coming downstairs to explore on her own like she’s never seen the house before. And she’s got her little panic room set up under my bed, complete with toys, a sock, and an old slipper. Violet is very confident that this is HER house. At least they’re playing now, rushing around the house having fun, instead of hissing at each other. Iris came with me when I opened the living room drapes this morning. She was on a side table beside one of the windows, I pulled the drape — and Imp Dog was out there, paws on the outer sill, looking in! They were both shocked, nearly nose-to-nose, just separated by window glass, yelped and ran as fast as they could in opposite directions. It was hilarious. Thanks for the tip on the outdoor furniture, by the way. I’ll keep my eye on both KMart and Target — and I’m trolling Craigslist every day, just in case. Paid the cell phone bill (which I forgot to do while Costume Imp was here). Picked up some things at Border’s — was disappointed when they didn’t have two books about which I’m excited in stock. But picked up a notebook I need for the herbal seminars, et al, and some magazines. Back home, unloaded, took care of some other business stuff, handled some stuff for my mother in her absence, and started taking down the decorations. I thought I could just pull boxes (since all of them are marked with what’s supposed to go into them), fill them, store them (made room — I have a whole “Christmas closet” in the storage area), pull some more, etc. Of course, that would be too easy, and too organized. I have to rearrange some stuff, so I’ve pulled the boxes into the back bedroom, spread them out, so I can arrange and re-arrange as I pack. And now I also have to find other cloths for some of the tables (digging through the linens bins in storage) and rearrange a few other things — sort of a domino effect. Made good progress, but not done yet. I took down the evergreen wreath, which is only starting to dry out now (not bad, considering I got it right after Thanksgiving) and put up the grapevine snowflake wreath. I have to remove all the evergreens from the wire frame before I can take them to the dump. Now I REALLY need to get that door knocker! I think I’ll get a pineapple one. The gothic knockers are have too dark a vibe, the Victorian ones are too frouffy, and we all know I’m on the Cape — I don’t need a starfish or a seashell or a mermaid — it’s too cutesy for the architecture. A nice, simple pineapple says “welcome” and will still be pretty, provided I keep polishing it. Won a pretty zodiac tile on eBay for the garden. I’ve got my eye on one or two other pieces, too, but found the same bits at an online store that will give me free shipping, so . . . The sun melted the snow on almost the entire back yard — good to know, good to grow. Getting some good groundwork done on the new piece. SHOULD be working on a few other pieces, too, but this one’s pulling at me, and I want to get it sorted out before I go back to anything else. Now that most of the moving and holiday chaos is over, I should be able to spend a good chunk of the day writing and another chunk of the day unpacking and organizing. I need to figure out what sort of structure to give my day, with the flexibility to change as things come up. One Story, Many Voices is going well. We’ve settled into a nice rhythm, although some students are getting into the pattern of post their previous exercise the day before before the next one is due instead of the day it’s actually due, which means they’re 3-4 days behind. Booked a lot of work for February and a lot of work for May, most of it in CT, so I’ll be on the road a lot of those two months. Gotta love wireless, laptops, and the fact that I stacked up on so many books in Niantic — I’ll have plenty to read. I’m worried about leaving the garden in May, but I’ll leave careful instructions. Deadheaded the indoor roses this morning, watered the plants that needed it. About to settle in for some quality writing time before I start commenting on the exercises due today. Later this morning, I’m taking the garbage and recycling to the dump, so it’s all out of here before the storm. I’m drinking soda. I have left over soda from the party, and I’m drinking the bottles that are open. The closed ones I can leave in the garage until whenever. I don’t have a moral position on soda or anything — I just rarely have it in the house, so I rarely drink it. And I kind of love those Shirley Temples . .
We’re set to have quite the storm. Hopefully, it won’t interfere with the live chat I’m doing for Savvy Authors tomorrow night. Depending upon which forecast you listen to, we’re getting anywhere from 7-20 inches overnight and well into tomorrow. We’ll see. Well, I have a migraine, so not a great start to the day. Get through, it right? There’s way too much that needs to get done. Chase Bank bites. Yesterday, I got pulled out of line by an Account Exec who made all these promises about these great changes in my account to reduce fees. Yeah, but they haven’t cleared my payroll check – which, I might add, is from another Chase account and has always cleared from Friday to Saturday – because I deposited several checks together, so they hold them ALL. I swear, they charge you every time you breathe, and every promise they make is a bait-and-switch to more fees they “forgot” to tell you about. Chase Bank gets the Middle Finger Award for the week. Unfortunately, it is very difficult to move banks right now, because if you’re not throwing a ton of cash at them to open the account, they don’t want you. The chat went really well last night. Lots of people, a lot of good questions. Caught up on commenting on everyone’s exercises this morning. I’m way behind on my exercises for other workshops, so I want to get that done, and I have an idea for a couple more ebooks. Now, I just have to figure out when to slot them in! Most of the conference has been great. Two of the instructors annoy me, because I get the feeling that they “don’t want to give it away for free.” In one, the exercises have been frustrating, but I figured I could learn something, that whole “work past your resistance/try something new”. However, the instructor doesn’t give individual feedback on how to APPLY what we do in the exercises, or why something works or doesn’t work. Just makes it clear she is available for private hire. The other instructor claims she didn’t know she was signed up to give a week long workshop – which is bullpucky, because we were sent emails over a course of many weeks with links to check our information, our virtual room, etc. and instructions on what to do if something was wrong or listed in the wrong spot or whatever. We had WEEKS to make sure it was accurate. There is no way this chick could “not know” unless she didn’t bother to check her information, and that is HER fault, no one else’s. In addition, she says she’s “too busy” to interact (which is a real slap in the face to conference goers, in my opinion), but again, available for private hire. I tried the old “oh, there are different ways of teaching” philosophy. It doesn’t wash in this case, in my opinion. I’m sorry, but WHY would I spend money on either of those two when I’ve gotten NOTHING from them in their workshops but the hand out? And neither handout gave me any new or intriguing information? I can spend my money better elsewhere, on instructors who actually step up to the plate and to their jobs. Oh, and when you download the handout, you automatically are signed up for their email blasts. Guess who’s going to opt out first thing Monday morning? And then there are the great workshops, like the short story one and the cozy workshop, and a couple of others where I just wandered in off the virtual street, so to speak, and ended up staying. Where the instructors interact, share information, encourage, point out where things could be stronger, are open to discussion and new ideas, ask interesting questions, and, in general, actually TEACH A WORKSHOP. I’ve developed material for two very different collections of short stories in the short story workshop. I’m developing material for the first book of what could be a series in the cozy workshop. I’ve gotten fresh ideas about website media rooms from another workshop, and gotten into interesting discussions about writing groups in yet another workshop. And I’m so proud of many of my own students, who show progress over the course of the week. Several of them have ended up with a near-complete short story in the scene building optional exercises, and there have been some fascinating scenes posted in the daily exercises which I hope they take farther. So there’s a lot of diversity here, which is part of what I think makes it such a good conference, and, in spite of some of the frustrating elements, a great overall experience. I have so much writing to catch up on today, so I have to push past the headache and get to it. I have a feeling I will sleep in on Monday morning. NEW!Sensory Perceptions: Techniques to Improve Your Writing Through the Six Senses by Devon Ellington. Use the six senses to take your writing to the next level via a series of sense-specific exercises. By the end of seven weeks, you complete seven short stories!. $1.29 USD. Here. Hex Breaker by Devon Ellington. A Jain Lazarus Adventure. Hex Breaker Jain Lazarus joins the crew of a cursed film, hoping to put to rest what was stirred up before more people die and the film is lost. Tough, practical Detective Wyatt East becomes her unlikely ally and lover on an adventure fighting zombies, ceremonial magicians, the town wife-beater, the messenger of the gods, and their own pasts. $4.00 ebook/ $6.00 on CD from Firedrakes Weyr Publishing. Visit the site for the Jain Lazarus adventures. 5 in 10: Create 5 Short Stories in Ten Weeks by Devon Ellington. This ebooklet takes you from inspiration to writing to revision to marketing. By the end of ten weeks, you will have either 5 short stories or a good chunk of a novella complete. And it’s only 50 cents, USD. Here. Writing Rituals: Ideas to Support Creativity by Cerridwen Iris Shea. This ebooklet contains several rituals to help you start writing, get you through writer’s block, and help send your work on its way. It’s only 39 cents USD. (Note: Cerridwen Iris Shea is one of the six names under which I publish). Here. I was hired to write two short articles by a new-to-me publication yesterday, so that will be fun. Worked on the exercises for the Dialogue Workshop. I’m creating them from scratch this year so they’re different from last year’s, although there will be some overlap. I have four definite N3s. I said I’d mentor only 3-5 this year (unlike 34 last year), so I feel like I’m set. I’m really excited about this trio. I feel as though they’re committed and really want to get the most they can out of Nano. I worked on The Big Project off and on, making notes for some non-sequential stuff, and I outlined the first third of another project. No idea where that will fit into the roster, but it’s something that’s fun and saleable, so I’d like to get it started before the end of this year. I’d figured out an intense sequence for The Big Project, and decided to rearrange a bunch of sequencing. But, when I went to write it this morning, I realized the sequencing didn’t make sense, so I had to go back to my original plan. The really cool part of the chat was that, not only did Costume Imp and I have a blast, we created a rough outline for a new Jain Lazarus adventure, which might end up being Book 4 instead of what I planned as book 4, which means there will be six Jain Lazarus adventures instead of five. And, of course, this one will be dedicated to Costume Imp! I had a bit of brain fatigue yesterday. I’m pushing myself hard on the writing front, but hey, there are bills to pay. I can’t afford, in any sense of the word, to let up right now. And a lot of the longer projects take more time, more thought, which means a longer time until I see a financial return. I moved the Goals, Dreams, and Resolutions to their own blog. Stop by, work on the questions, and, in the coming months, we can post our progress, to-do lists, brainstorming ideas, etc. PJ – yes, “The Big Project” is a code for a massive project that could be the start of a long-term, creatively fulfilling and possibly lucrative association if it all works. If it works and the contracts are properly signed, sealed, and delivered, I’ll be able to reveal more! I did some work on ANGEL HUNT yesterday – great to be back with Lianna, Lachlan, Gaston, Zeke, et al and galloping towards the finish line of this draft. Zeke is one of the most deliciously twisted villains I’ve ever written, and quite different from any I’ve read, too. He is uniquely, remarkably himself. You can’t help but love him, even when he’s out to kill ya! Tossed out chapter two of the western and rewrote it, so now it works (better), and managed to hack out a good chunk of chapter four. The word count isn’t raised that much, in spite of all the work, but, oh well. Printed out the first three chapters because, well, I’m paranoid. And Mercury’s retrograde. So, building scum has decided “no one” needs hot water between the hours of 9 AM and 5 PM, or after midnight, the same way they decided “no one” deserved heat those same hours last winter. Yeah, it’s illegal. But since when has it stopped them? Time to file more legal paperwork. The live chat time has been changed – I’m lucky I happened to see a posting, because I didn’t get an email about it, and I would have been there at the wrong time. It’s at 9 PM EST – sorry to the overseas friends who’d like to participate, I certainly don’t expect you to be hanging around at 3 AM your time. It’s 9 PM EST. Go to the FireDrakes Weyr site and enter the conference room, and we’ll talk. The computer was persnickety last night and I was ready to smash it with an axe, not a smart solution, but it would have made me feel better in the moment. How much do I loathe Microsoft? Let me count the ways. Only none of us have that much time or patience. Bill Gates, you owe me a new computer THAT WORKS, instead of one that’s built to fail so I keep having to pour money into the black hole that is Microsoft. Got a nice chunk of the Big Project done this morning. I want to work on the western and ANGEL HUNT a bit today, do some transcription, and also work on the ebook and the ghost story. Too much to do, too few hours in the day, but boy, do I get a lot done when I’m only on my schedule and not someone else’s!